The moral of this story is…when life gives you a carrot cake that clings to the pan despite an ample coat of baking spray, make Carrot Cake Yogurt Parfaits! A second moral might be…when you change a cake recipe – even slightly – there may be repercussions. And we may as well go for a third moral…sometimes things may not go as planned, but they may end up even better. In the end, I’m actually glad my original plan for a nice, traditional carrot layer cake with cream cheese frosting for Easter dessert didn’t work out. I ended up with fabulous carrot cake dessert that, with maple-whipped Greek yogurt in lieu of frosting, was just as delicious and even a bit healthier. Read on to hear about where I messed up…ahem, changed course…and how I ultimately wound up with results even better than I’d planned. The cake itself came out wonderfully. Well, it tasted wonderful…the first layer came out of the pan in chunks. I took a few deep breaths – I hadn’t had a cake stick to the pan in years. The recipe, from the back of a package of coconut, was as simple and straightforward as they come – I was a little perplexed. I did make one tiny change to the recipe – I wanted a layer cake, so I baked the batter in two 8-inch round pans rather than the 13×9-inch pan the recipe called for. This wasn’t a problem, everything baked fine in the 8-inch pans. BUT since the original 13×9-inch recipe didn’t anticipate anyone needing to invert the cake – in that size, you usually frost and serve right from the pan – it didn’t contain directions for how long to allow the cake to cool before inverting. I have a fourth moral to add…when in doubt, Google it. I was in doubt, I didn’t Google it, and I turned the cake out of the pan too soon. Bon Appétit, I learned through subsequent Googling, advises that a cake might stick to the pan if it’s inverted immediately after baking (I’d waited 10 minutes, but still). I let the second layer cool for more than an hour before inverting and, as you can see above, it remained perfectly intact. My first inclination was to bake a new layer, allowing the proper cooling time before inverting, and then continue on with my layer cake as planned. But then I changed my mind. I wanted to use this broken cake for good! After toying with the idea of mini trifles, my attention turned to the ever-present tubs of nonfat Greek yogurt I had in the fridge. The yogurt was tangy, just like cream cheese, with the added benefit of being fat free, high in protein and available on hand. I whipped it with some maple syrup for sweetness – oh yes, that’ll do. I layered my broken cake chunks (less than a full double-layer slice’s worth) along with my maple-whipped Greek yogurt and topped it with toasted pecans and coconut – it was divine. And a little less guilt-inducing, I might add. While I can hardly call this a healthy dessert, swapping out the cream cheese frosting for nonfat Greek yogurt cut down on the fat per serving rather substantially. In the original recipe, the frosting alone accounted for 16 grams of fat per slice of cake (assuming 10 slices total) – I wiped all of that fat out with the yogurt and kept the sweet, creamy, tangy flavor. All’s well that ends well. Heat the oven to 325°F. Mix sugar, oil and eggs until thoroughly blended. Sift together flour, soda, salt and cinnamon. Add to sugar mixture, beating until smooth. Stir in carrots, coconut and pecans. Pour into a greased 8-inch round or square pan. 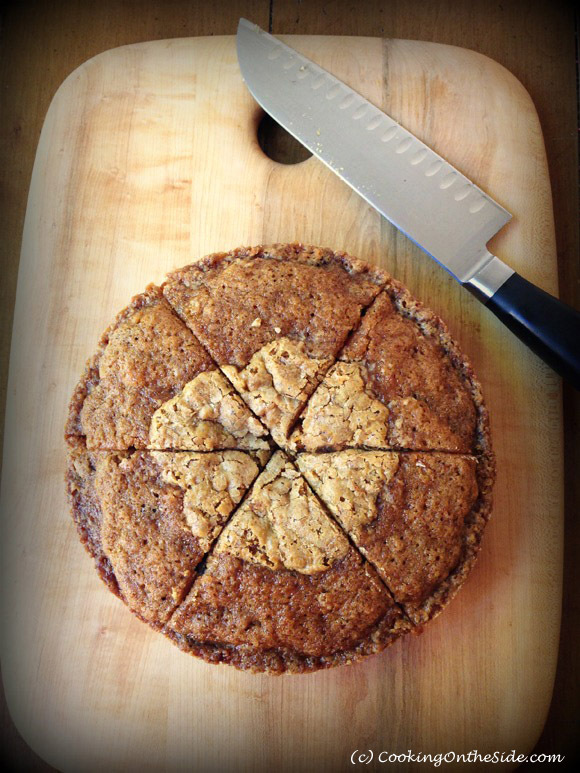 Bake for 50-55 minutes, or until a toothpick inserted in the center comes out clean. Let the cake cool completely in the pan before removing it. With the oven still on, spread the pecans and coconut for the topping onto a baking sheet and set it in the oven. Toast the pecans and coconut, tossing occasionally, until they’re lightly browned and fragrant, 5 to 7 minutes (keep a close watch on them so they don’t burn!). Whip the yogurt and maple syrup in a blender, mini-prep food processor or with an electric mixer until it’s creamy, smooth and shiny, about 2 minutes. Transfer it to a small bowl and refrigerate it until you’re ready to assemble the parfaits. When the cake is completely cool, divide it into 6 equal portions. 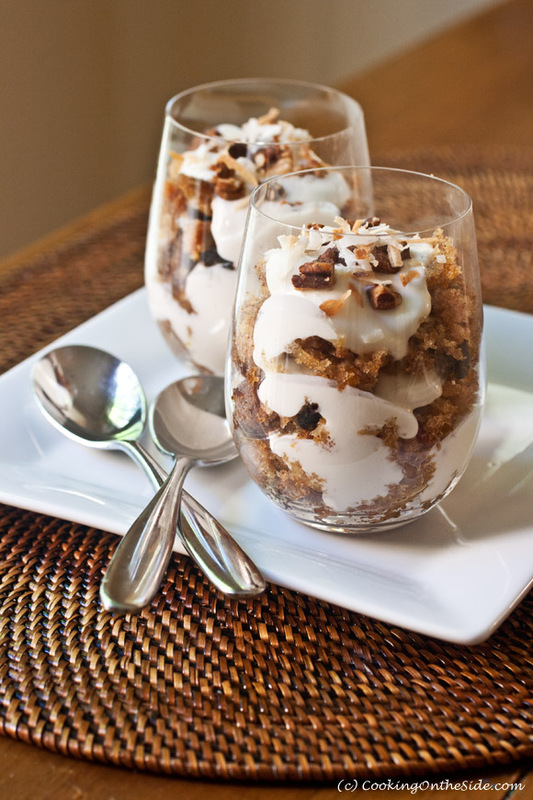 For each parfait: Break up 1/3 of a carrot cake portion and lay the chunks in the bottom of a serving glass or bowl. Top the cake chunks with a few spoonfuls of Maple-Whipped Greek Yogurt. Repeat the layers twice more, ending with yogurt on top. Sprinkle a few spoons of toasted coconut and pecans on top. Serve cold. The parfaits can be made several hours in advance. Oh my goodness! What a great use of a broken cake!!! It looks so delicious!!! A smart and elegant fix! I never would have thought of doing this! What a great way to use broken cake. 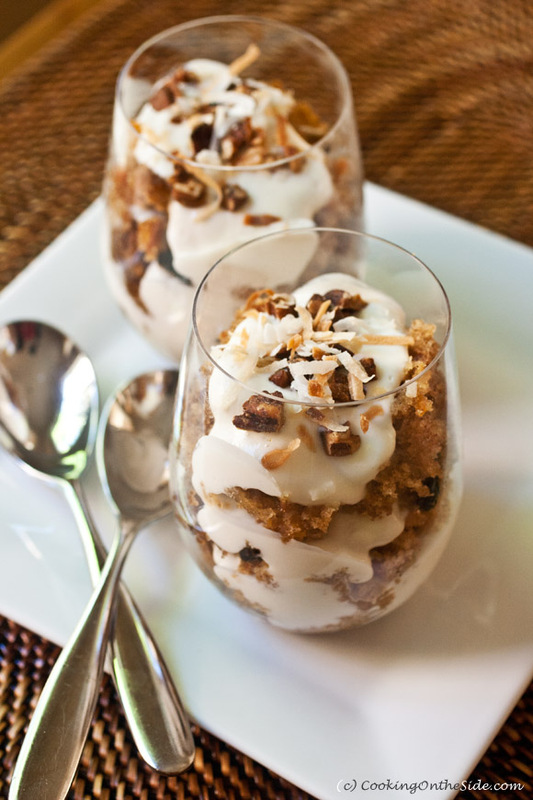 These carrot cake parfaits sound just as good, if not better than traditional carrot cake! Oh my word, I would savor every last bite! I think I love parfaits even more than regular cake…so this is perfect. Love!! shelly (cookies and cups)´s last blog post ..$300 Albion Fit Giveaway!! Last year, I had a ginger cake that stuck to the pan. I wish I had thought of this! Instead, I served mangled slices with a dollop of whipped cream and some caramel sauce. There’s not a lot that whipped cream and caramel can’t fix! Would you happen to know how many calories are in one serving?